Full Disclosure: This tree is short lived, it has invasive roots and it has limbs that can easily break, so it belongs in an open area, not near a building. 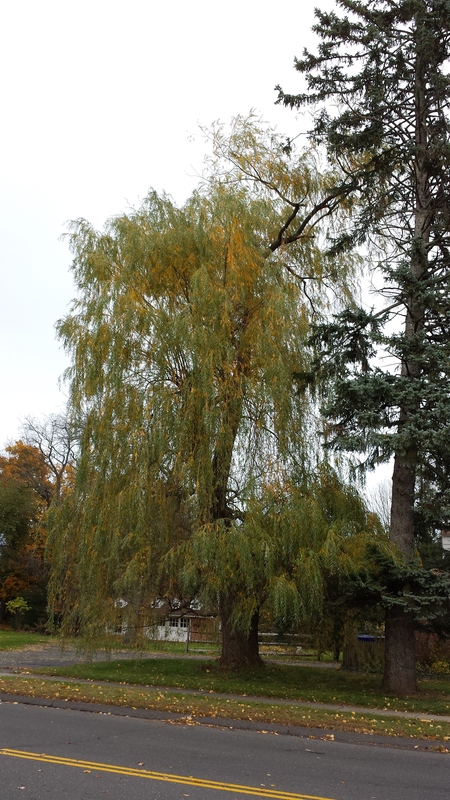 All of that being said, if you want a tree that is the first to show color in the spring and one of the last to lose its leaves in the fall, the weeping willow (salix babylonica) is it. It also has a lovely form for a weeping tree–although it is not a dwarf tree by any means! Even in a home landscape, the willow can achieve impressive heights! One of the reasons I have singled out this tree as one to notice–and possibly to grow in the correct location only–is precisely because it “greens up” so early in the spring. I will often notice this tree showing color in the twigs in early to mid February. Now it’s certainly not even thinking about putting on leaves at that point–not in my climate!–but it is definitely showing signs of life. In February, that’s good enough for me, particularly at a time when the ground may be completely covered in snow! But notice I’ve said that this tree has to be grown in the correct location. It can get to be quite large. In fact, this tree in the photograph is only a shade of its former self–half of it was lost in the early snowstorm of October 2011. Evidence of that may still be visible to careful observers. Because of its large limbs, you don’t want to grow this too near homes or garages. And because of its invasive roots, you certainly don’t want to grow this anyplace with a septic system or well. So this tree is not practical for a lot of folks. Pay attention to that! Still, in the right place, this can be a great tree. Otherwise, just admire someone else’s next spring!